This tree is located between the Peabody Library and Magnolia Circle, just to the west of the sidewalk that leads from Magnolia Circle to the Esplanade. Pin oak leaves are distinctive among the oaks, with 5 to 7 lobes that project nearly straight out from the midvein and taper to a point. The acorn cups have narrow caps and may have a somewhat striped appearance. If you look up a large tree, you may notice its somewhat striped looking bark and branches which spread out from the main trunk like spokes of a wheel. 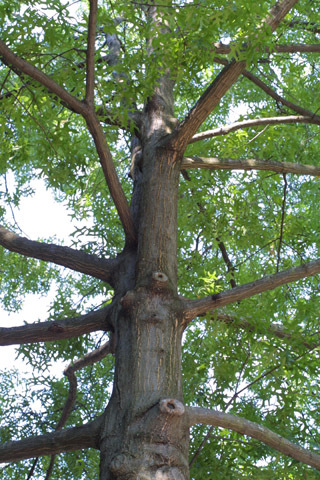 In the wild, pin oak would be found only in low, wet areas. However, it is a commonly planted street tree. It is present at a number of locations on the Vanderbilt campus. This organism is a living specimen that is part of the  Vanderbilt University Arboretum  with the local identifier 1-506.